Previously I had posted some of the information below but have since added more which can be found at the end of this article. The following information is extracted from my text The Internal Practices of Sun Lu-T’ang in which Madam Sun Jian-Yun [Sun Lu-T’ang’s daughter] provides answers to questions we proposed to her over the years. In this instance she provided a brief, general explanation. Q: Master Cheng T’ing-Hua taught that the practice of Shitze Bao Qiu (Lion Embraces Ball) was among the most essential baguazhang postures to practice. What is the significance of this posture? A: Each day my father walked the bagua circle, shaping his body into the posture Shitze Bao Qiu (Lion Embraces Ball). 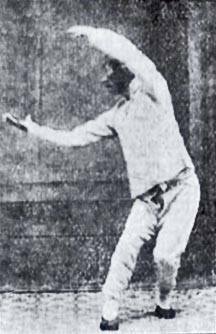 Master Cheng T’ing-Hua taught that this was the manner by which the body rounds like a large ball while the arms round as if holding [embracing] a ball. This is roundness contained within roundness, roundness embracing roundness, unifying with the T’ai Xu (Great Emptiness [Cosmos]). These two roundings interact like the yin and yang, merging with the One [the Tao]. Walking the circle moves the yin-yang to roll and turn within the sphere of the circular path. One’s body must attain the spirit of curvature which in turn leans and presses upon the circle’s center. Both hands zhuan (pierce) to establish their presence with the Tao, this being straightness [piercing] manifesting within the circle’s roundness. Pointing the way one’s index fingers stir the qi within the Great Pivot [referring to both the core of the circle and the center of the Cosmos being mirrored reflections of each other] which in turn excites the qi of the lower cauldron [the lower tan-t’ien]. Adding to the basic explanation above is my translation of Sun Lu-T’ang’s writings on 獅子掌之形 Shīzi Zhǎng Zhī Xíng (Lion’s Palm Form/Shape). In class Madam Sun provided us with much deeper explanations and training methods that were passed down only in class to students of senior status. This one posture has just over six pages of teachings to follow that were never published. We had asked Madam Sun if she had ever thought to write a comprehensive explanation on each posture in the Sun arts? She said that such information can only be taught in person from teacher to disciple. Below is just a short piece from 獅子掌之形 Shīzi Zhǎng Zhī Xíng (Lion’s Palm Form/Shape) writings from Master Sun Lu-T’ang. In the posture 獅子掌之形 Shīzi Zhǎng Zhī Xíng (Lion’s Palm Form/Shape) [it is] as if both hands are 穿 chuān (piercing). However, the right hand [which is] below goes upward as if 畫圓形 huà yuán xíng (drawing a circular shape), the left hand 仍 réng (remains) [below], together [the hands are] as if 抱 bào (embracing) a large round ball, [this is] the 意 yì (intent). Both feet walk and 隨 suí (follow along) as both hands draw [draw a circular shape]. Also, the 意 yì (intent) is that both hands are as if 穿 chuān (piercing), piercing until both hand’s 食指 shízhǐ (forefingers) are 處 chǔ (positioned on) 相對 xiāngduì (opposite) [sides] of the void/empty center of the circle, [this is] the 準則 zhǔnzé (the standard) [by which to practice] as in the photograph.